One of our best sellers in Bangalore! Lusia Inn is offering accommodations in Bangalore. Among the facilities of this property are a restaurant, a 24-hour front desk and room service, along with free WiFi. The property is located 1.1 miles from Kanteerava Indoor Stadium. Visvesvaraya Industrial and Technological Museum is 1.5 miles from Lusia Inn. The nearest airport is Kempegowda International Airport, 22 miles from the accommodation. When would you like to stay at Lusia Inn? House Rules Lusia Inn takes special requests – add in the next step! 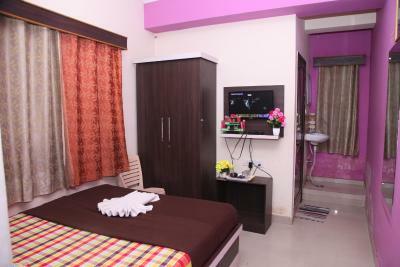 Any additional children or adults are charged INR 250 per night for extra beds. Lusia Inn accepts these cards and reserves the right to temporarily hold an amount prior to arrival. Location was horrible. Price too high for location. Surrounding areas very dirty environment. A nest of kites nearby. Cleanliness not up to standard. Normal room. No chairs . Not suitable for family trip. No kitchen. Staff and manager very helpful. Location good. Wifi. TV provided. Hot water in bathroom in the morning. Suitable only for travelling for business purpose.